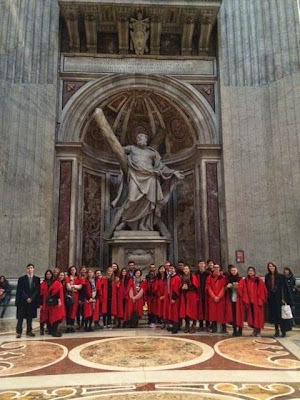 The Catholic students of St Andrews University recently made a pilgrimage to Rome, led by their chaplain, Fr Michael John Galbraith, a hard-working and devout young priest whom I have the privilege to know personally. Over the years I have made many visits to Canmore, the home of the Catholic Chaplaincy, to give talks to the Catholic Society which has remained impressively strong, providing a formative environment for many vocations to priesthood, the religious life, and to Catholic marriages. While in Rome, the students were given a tour of the Congregation for the Doctrine of the Faith by one of the priest officials there, who is himself an alumnus of St Andrews. He too is a fine young priest (remember that I am getting older!) and works hard at what is sometimes a thankless task in the Curia (not a job I would want for all the tea in China) for the love of God "et pro felici statu sanctae Romanae ecclesiae."